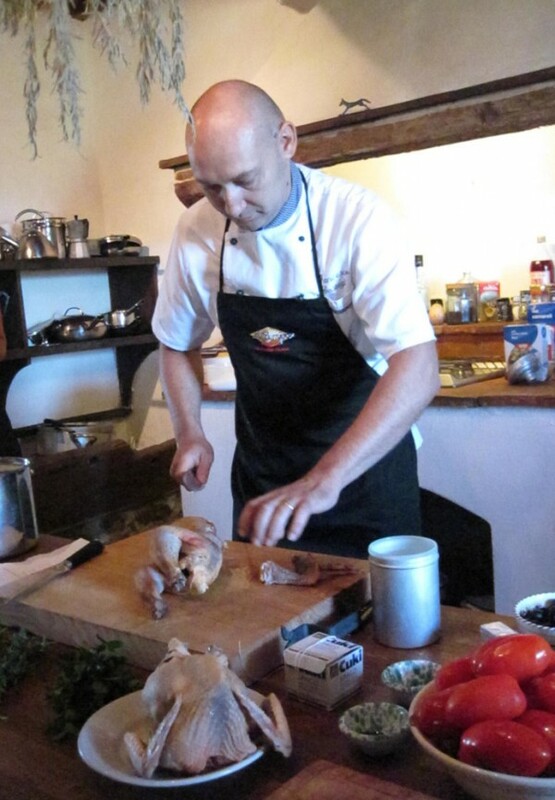 Chef Francesco Costagli prepares guinea fowl for the pot at Il Campo Cucina cooking school. 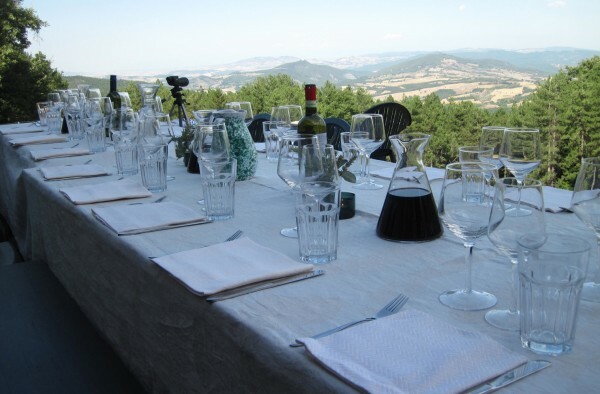 It's hard to imagine a prettier spot than a Tuscan hillside for an outdoor gathering following a morning of cooking. Il Campo co-founder Marlane Miriello serves up food, wine and laughter following the morning class. 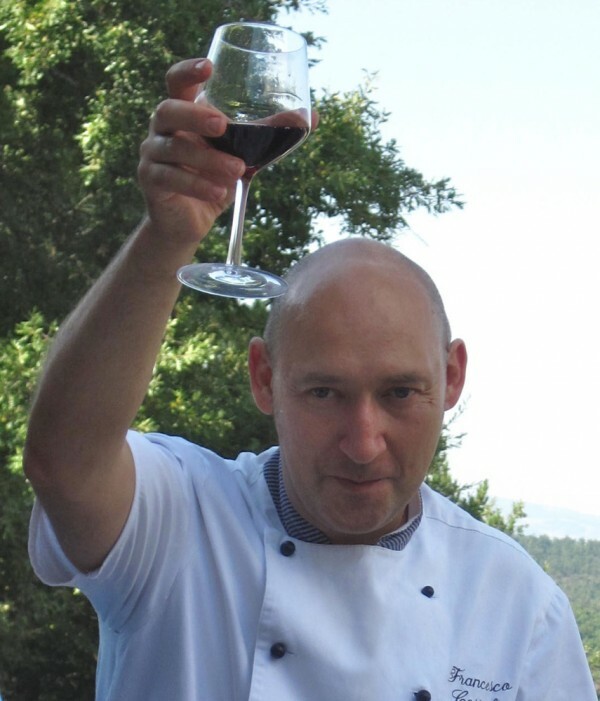 Chef Francesco Costagli raises a glass in toast following his morning of teaching 11 cyclists the finer arts of Tuscan cooking at Il Campo Cooking School. Roast Pork Tenderloin with Pepper Salad. 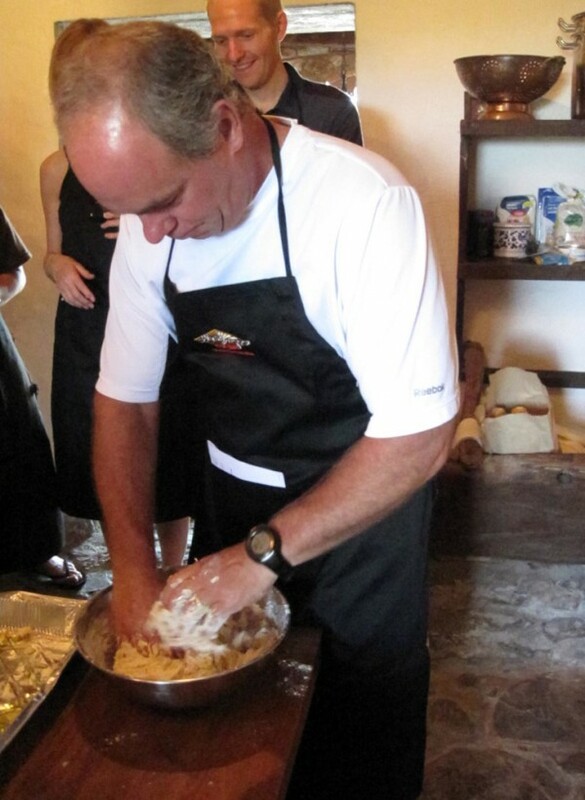 Il Campo cooking student Dave Smith gets some hands-on time kneadng dough for focaccia at Il Campo Cucina Cooking School. FORT KENT, Maine — Embarking on a new experience in the Tuscan countryside is a bit like opening a gift from a favorite aunt — the outcome is a mystery, but you know it’s going to be something wonderful. Something wonderful indeed was waiting at the end of a long, winding gravel road outside the hilltop village of Radicondoli. Just over a year ago, Marlane Miriello co-founded Il Campo Cucina Cooking School where participants find themselves immersed in the foods, wines, history and culture that make every meal in Radicondoli an experience of all the senses. Eleven of us were signed up for the morning class taking place at the hillside villa owned by Connecticut-based architect and builder Peter Woerner, who opened his doors and kitchen to our group of eager and hungry students. It would be hard to imagine a better spot for our class — the stone walls, tile roof, fresh herbs growing outside the kitchen door or drying on a rack overhead. Not to mention the inviting infinity pool on the terrace. At Il Campo, it’s all about using local ingredients to prepare local delicacies in the manner of local cooks. The cooks of Radicondoli, Miriello said, often look no farther than their own backyard or the backyards of friends and families for their ingredients. Miriello, who is from California and whose family has a home in Radicondoli, said it was the stories of village life told by her Tuscan friend Federica and that woman’s grandfather Guido that planted the seed leading her back to the village, initially to learn as much as possible about the foods and cooking. In those kitchens, Miriello found herself treated to butter and sage topped gnocchi, tomato and pine nut drenched ravioli filled with fresh local sheep’s milk ricotta, handmade pastas in rich ragu and heavenly desserts like tiramisu. With the help of her friend Giovanna Hipting, owner of a small Radicondoli shop, appointments were made with local women and Miriello found she had made it into what she terms the “inner sanctum of Radicondoli” — those private kitchens. Since the cooks of Radicondoli use no written recipes, Miriello asked endless questions and took numerous notes on ingredients, process and cooking times. At some point, Hipting brought up the idea of the two women starting up a Tuscan-based cooking school, using the cooks of Radicondoli as the teachers. Some emails were sent to friends and friends of friends and in the spring of 2010, Miriello said, they had two “test groups” of students booked for cooking classes. Now Il Campo offers weeklong cooking courses throughout the year from the villas and kitchens of Radicondoli. Students visit vineyards, pick local vegetables, sample artisan cheeses, learn to prepare pasta, tour medieval villages, explore formal gardens and even have the opportunity to hunt wild boar with a local count in his private forest. This year the school expanded to offer a special yoga retreat for writers. Our group was taking a break from bicycling in Tuscany and Miriello had tailored a special one-day class under the instruction of Michelin-star chef Francesco Costagli, a man who appeared to be equal parts culinary genius and gastronomic magician. On our day cooking at Woerner’s villa Costagli was joined by his wife, pastry chef Mara, and their young son Lorenzo, in teaching us the art behind dishes like Frittata in Trippa con Nepitella, a dish normally prepared with tripe in which Costagli thankfully substituted egg; Risotto alla Vernaccia con Ragu di Faraona — Wine Risotto with Guinea Fowl Ragu; Arista Arrosto Insalatia di Peperoni — Roast Pork Tenderloin with Pepper Salad; and Crostata di Fichi — Fig Tart. The preparation of each course was paired with Tuscan wines, fresh foccacia bread and seemingly gallons of locally produced olive oils. Some of us were set to kneading the focaccia dough, others sent outside to gather herbs or handed knives to chop vegetables or peel figs for the tart. Soon the smells of sauteing guinea fowl, roasting peppers, simmering tomato sauce and baking bread filled the villa’s kitchen, competing for space among the laughter, conversation and bantering that accompanies the preparation of a great meal. Forget civilization building, government or organized religion. As far as I’m concerned, cooking truly is the ultimate human social endeavor. Followed, of course, by eating. While we had been toiling over a hot stove — or, more to the point, drinking wine while Costagli did most of the toiling — Miriello and Hipting had set a table for an al fresco meal fit for a Bon Appetit photo-shoot. Over lunch, Woerner, 68, told us how he’d first come to Italy when he was 19 and fell in love with the Tuscan countryside and its people. That love affair never dimmed and in the late 1980s he began a quest for a villa to call his own, finally settling on one that was, at best, a fixer-upper. Hard to imagine now, but Woerner said back then the villa was in near total ruin and he spent the next two decades restoring it to its original glory, often with the help of his student interns. So successful was Woerner in his restoration work that the villa was featured in Architectural Digest magazine and the entire four-bedroom residence is available for weeklong private bookings starting at $3,000 — contact pwoerner@sbcglobal.net for information. It’s obvious Woerner’s biggest joys come from sharing his villa through collaborations like the one he has with Il Campo Cucina to host classes. “This [villa] needs people to enjoy and love it,” he said. Sharing hearth, home and good times is central to the daily life in Radicondoli and the Il Campo mission. Safe to say we all carried some of that paradise back with us — and a post-luncheon dip in that infinity pool was the icing on the tiramisu. 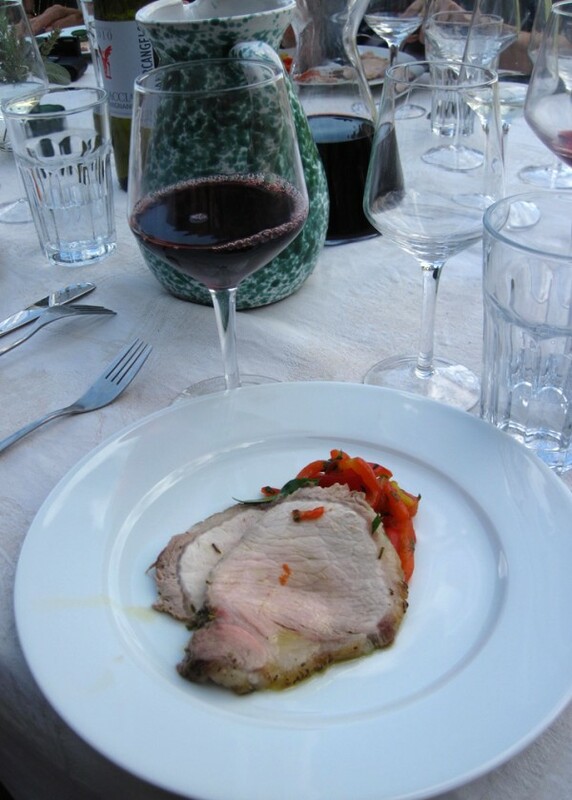 Complete information on Il Campo cooking classes, itineraries and pricing is on its website at http://marlanemiriello.com.